Like legendary sorcerers, the master storyteller can wield great power. Master the power of words and you will make your reader smile with amusement, laugh, cry, cringe in terror, feel a tingle up their spine, be compelled to share your story with others, or blurt out a resounding Yes! as your protagonist survives to live another day. In the hands of a master, words are power, weapons of mass instruction. They yield the ability to influence others, share ideas, entertain and inform. Words can be woven into many patterns, and like magical incantations or devout prayers they can allow your deepest inner thoughts and imaginings to shine forth. To become a talented and accomplished writer is a worthy goal. The fact that you are holding this book in your hands or reading it on a screen indicates that you would seek to improve your ability to use words effectively. When your words evoke far more than just their defined meanings, you will have mastered their power. It is a quest worth pursuing, and the ultimate test of any writer. The wonderful experience of creativity does not come from without, but from within your prepared mind, the mind of a writer. Master these arts and you may discover that you are filled with stories that yearn to be told. There are many ways to craft powerful writing, writing that entertains, engages, informs and excites the reader. In the end, you must find your own voice as a writer. This book can start you on that quest, or help lead you further along the way. Words are exciting things, fun things. You can spend a lifetime playing with them; you will find few more rewarding companions. 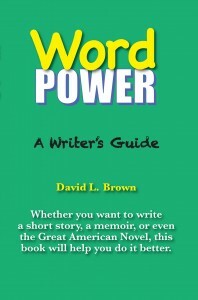 Word Power: A Writer’s Guide. By David L. Brown. Trade Paperback, 180 pages, approx. 50,000 words. ISBN #9780996608510. Retail price: $9.95. Whether you want to write a short story, a memoir, or even the Great American Novel, this book will help you do it better. David L. Brown has worked as a journalist, editor, publisher, professional landscape and travel photographer, public relations counselor and writing coach. He is the author of seven books, including four novels. A graduate of the top rated Missouri School of Journalism, he lives and works in Moab, UT where he leads local photo tours and puts on writing and landscape photography workshops.